Polymer electrolyte fuel cells are energy conversion devices that when fed with hydrogen produce electrical current. These devices operate at temperatures in the range of 60-80C and produce only water as a byproduct. They are curently being investigated as an alterative to the internal combustion engine in transportation applications, as an alterative to batteries and generators for backup power and as an alteranive to batteries in portable applications. Critical prerequisites for the commercialization of polymer electrolyte fuel cells are improvements in performance, reliability and durability as well as reductions in production costs. In this project, we are developing a computational framework for fuel cell analysis and optimization as an innovative alternative to the time consuming trial-and-error process currently used for fuel cell design. The framework is currently based on a two-dimensional through-the-channel isothermal, isobaric and single phase membrane electrode assembly (MEA) model. The model input parameters are the manufacturing parameters used to build the MEA: platinum loading, platinum to carbon ratio, electrolyte content and gas diffusion layer porosity. The governing equations of the fuel cell model are solved using Netwon's algorithm and an adaptive finite element method in order to achieve quadratic convergence and a mesh independent solution respectively. The analysis module is used to solve two optimization problems: i) maximize performance; and, ii) maximize performance while minimizing the production cost of the MEA. To solve these problems a gradient-based optimization algorithm is used in conjunction with analytical sensitivities. This project started in 2004 and it is in active development. In the following years, this design framework will be validated against experimental data and used to try to design new membrane electrodes assemblies based on advanced materials. New physical phenomena and porous media characterizations, such as convective transport in porous media and a more thorough representation of the porous media based on molecular dynamic simulations, are expected to be included in the model. Further, several enhancements in the design framework are underway in order to represent manufacturing constraints and to extend the number of design variables to geometrical parameters. This project is in collaboration with NRC-IFCI, Ballard Power System and AFCC. At the heart of any fuel cell is the catalyst layer. It is in this layer that the electrochemical reactions that produce electrical current take place. Current catalyst layers are usually ten micrometers thick (around ten times smaller than a human hair) and are a composite of a catalyst, a catalyst support, an electrolyte and a pore network. Given the small scale of this layer, it is extremely difficult to study the electrochemical reactions inside the layer experimentally. At the ESDLab, we are investigating mathematical models for the electrochemical reactions and the transport mechanisms that occur inside the micro-structure of the cathode catalyst layer of a fuel cell. 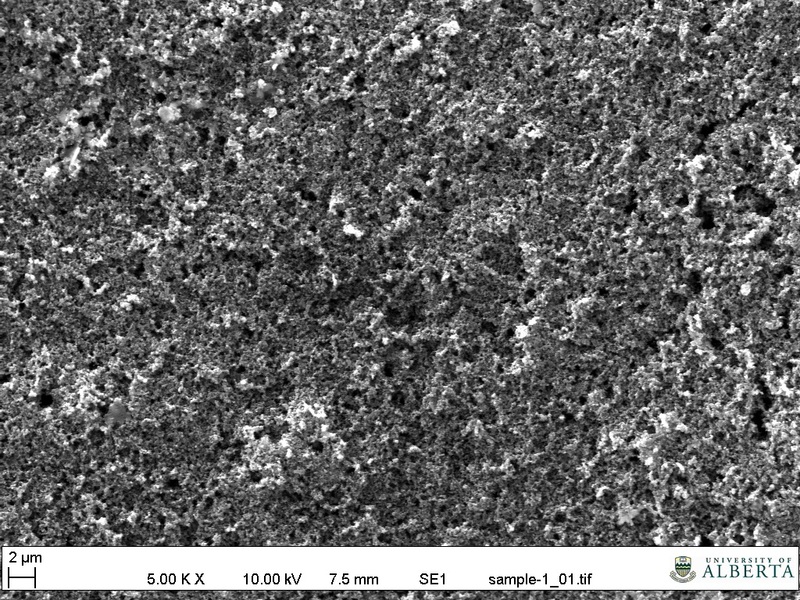 We are currently developing a new kinetic model and have developed several multi-scale catalyst layer models that take into account the carbon-catalyst aggregation during the fabrication process of the electrodes. Results will be used to provide guidelines to manufacture better catalyst layers. The models developed will finally be integrated into a computational design tool that can be used for electrode manufacturers to obtain optimal catalyst layer compositions. To understand the physical processes occurring in a porous media (e.g., mass, charge and energy transport in PEFC catalyst layers), numerical modelling can be used. However a detailed physical model of the porous structure is necessary for simulation purposes. At ESDLab, we are developing a stochastic analysis and reconstruction software. This software can characterize a porous media from images using statistical correlation functions. 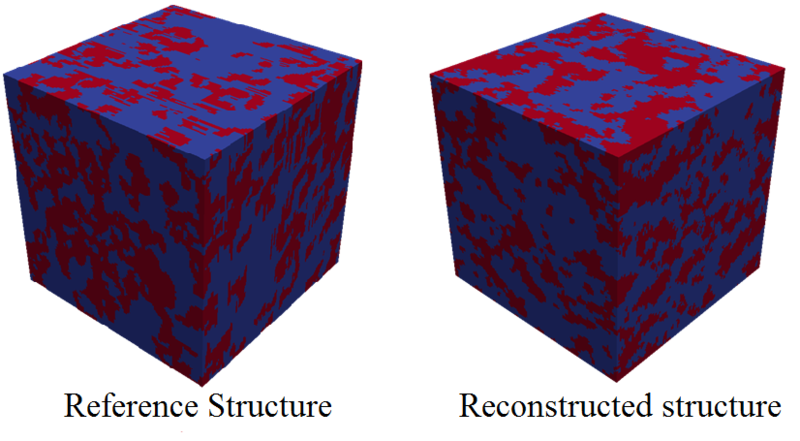 Furthermore, the software can reconstruct high accuracy porous media structures using techniques of simulated annealing. Novel methods are being used to enhance the speed of reconstruction, accuracy of the reconstruction and phase connectivity of the reconstructions. The aim of the research is to be able to characterize a porous media and its transport properties by analysing the statistical information. Inspired by the mass transport limitations in ultrathin catalyst layers due to two-phase flow, a promising new approach to analyze water transport in microporous layer (MPL) used on proton exchange membrane fuel cells (PEMFC) is under development. The mixed wettability of the MPL is taken into account by means of a novel pore-size distribution (PSD) model, which leads to expressions to estimate saturation, liquid relative permeability, gas relative permeability, liquid-vapor interfacial surface area, total surface area of the pores of the MPL and average Knudsen radius; using the assumption that porous materials can be represented by an array of straight cylindrical microtubes and nanotubes with void spaces. With the proposed model, microstructural information of the MPL often neglected by previous models is taken into consideration, without adding the burden of large-scale computations usually associated with conventional computational fluid dynamics (CFD) and the Lattice-Boltzmann methods (LBM). The catalyst layer (CL) is the heart of any fuel cell where the chemical reaction takes place. The performance, efficiency and cost of the PEMFC ultimately depends upon the Pt loading, thickness and structure of the catalyst layer. There are two main techniques by which the CL is deposited. Conventional methods such as hand painting, screen printing and spraying, and ultra-thin deposition methods like sputtering and ion-beam electrodeposition. At the ESDLab, inkjet printing is currently being tested to fabricate catalyst layers over the polymer membrane. Once, optimized, it is likely to be more economical and beneficial than currently used methods. A comparison between other 'carbon-supported catalyst' fabrication methods will be carried out to evaluate its performance. The starting ingredient for the CL deposition process is catalyst ink. Using the right method of preparation of the catalyst ink will result in a smaller particle size, better mass transport and a higher catalyst utilization. 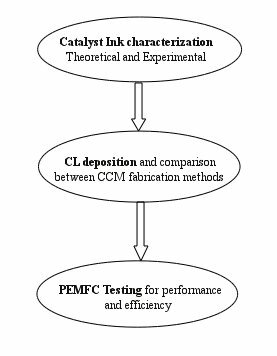 Thus, a theoretical and experimental characterization of the catalyst ink is begin carried out which can hopefully yield a better deposition and increase efficiency of the CL.. In recent years polymer electrolyte fuel cell technology has emerged as a promising alternative to the internal combustion engine and batteries. Fuel cells have significant advantages over the internal combustion engine such as zero-emission, silent operation and higher efficiency. However, in order to increase the market penetration of fuel cell technologies, further cost, durability and reliability improvements are necessary. In order to reduce fuel cell costs, one of the most challenging goals in fuel cell design is to increase the catalytic efficiency of the catalyst layer, so that the amount of catalyst can be reduced. The goal of this study is to understand mass transport limitations is porous media to improve the transport of reactants. This will improve the performance of PEMFCs, which in turn will reduce the catalyst consumption. An experimental setup is designed to investigate convective and diffusive mass transport in porous media of fuel cell electrodes. A new theoretical model is also developed in order to correct for inconsistencies in current models. 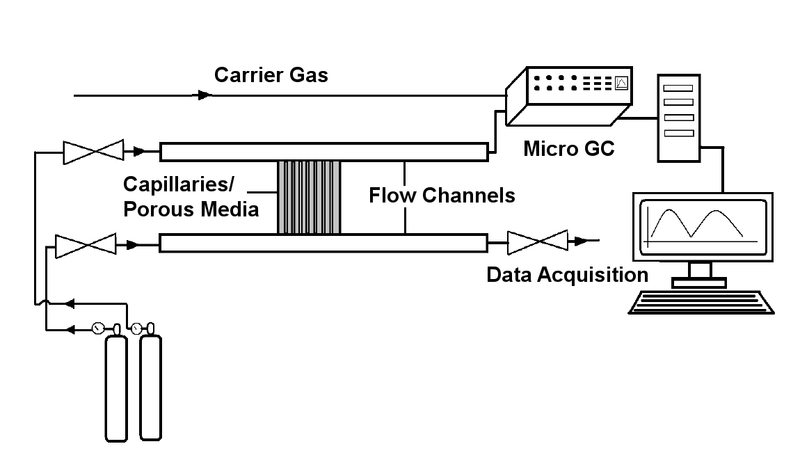 Based on the new model, a new data extraction technique has been proposed to obtain permeability and Knudsen diffusivity of a porous media from steady state pure convection measurements. The model is also used to obtain effective diffusivity of porous media from mass transport experiments. Using the obtained transport properties, the models are used to predict mass transport in the electrodes under different operating conditions. Preliminary comparisons of experimental and theoretical predictions show that the new mass transport model is capable of predicting mass transport in the electrode accurately. The results also show that the traditionally used Bruggeman correlation overpredicts the electrode effective diffusivity by as much as 3-4 times. In order for a fuel cell to operate efficiently, the fuel (hydrogen) and reactant (oxygen) gases have to be distributed evenly throughout the cell. Currently, this is achieved by using a large network of small gas channel (around 1mm wide). However, the distribution of the reactants is not as uniform as it would be desired. This leads to hot spots inside the cell and regions with larger amounts of water making some areas of the cell unusable. 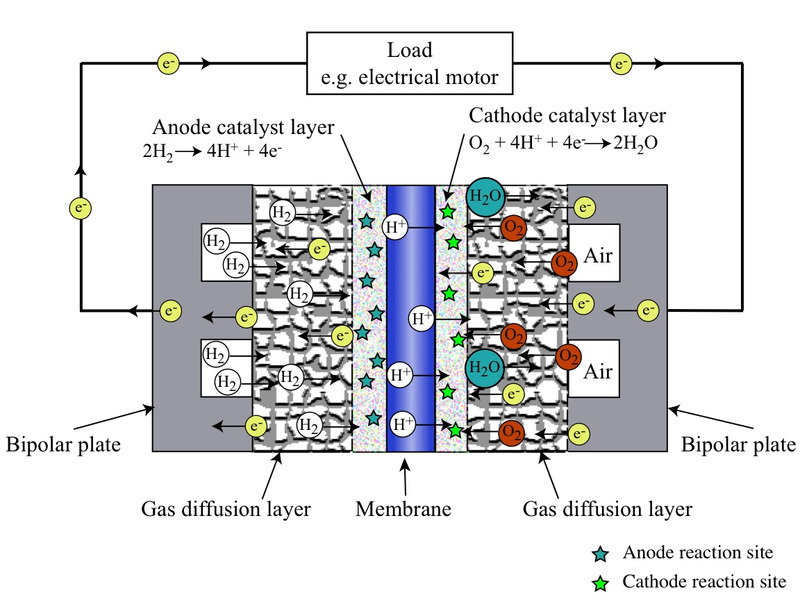 The fuel cell is fed with gas mixtures in both anode and cathode. In the anode, a binary mixture of hydrogen and water vapour is used. The hydrogen is the fuel and the water vapour is used to keep the membrane electrode assembly humidified. In the cathode, humidified air is usually fed to the cell. Since the fuel cell is fed with a gas mixtures, it is very important to understand how each component, in particular hydrogen and oxygen, are transported within the mixture. The study of mass transport in mixtures of several components is known as multicomponent mass transport, a very active area of research. 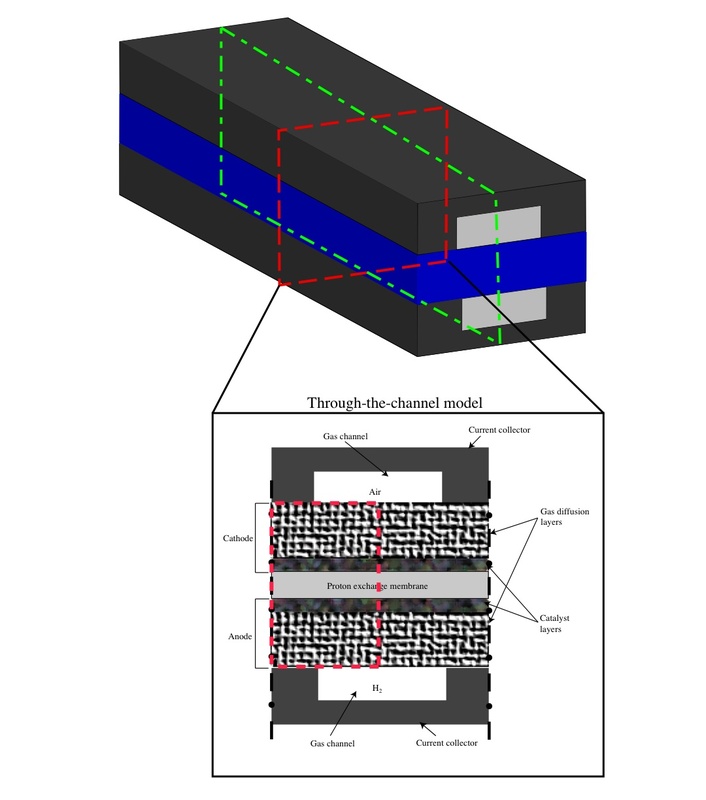 In this project, we are developing a computational model of the multicomponent mass transport occurring in fuel cell microchannels used to deliver gas to the membrane electrode assembly. The results from this project will be used in order to design innovative channel topologies and geometries in order to distribute the fuel and reactant more evenly in the fuel cell. This will result in improvements in performance. A better understanding of multicomponent transport is also needed in many other applications such as in the modelling of biomass reactors, carbon capture and sequestration technologies and membrane separation. In this project, a design tool for aerodynamic shape optimization was developed by coupling a CFD solver and a gradient-based optimization package. The aerodynamic solver is a parallel viscous Navier-Stokes solver with a Spallart-Allmaras one-equation turbulence model to account for turbulence. The optimization package contains three optimization algorithms: the modified method of feasible directions, sequential linear programming and sequential quadratic programming. The developed tool is used to obtain minimum drag airfoils subject to a minimum lift requirement. The results show a 20\% reduction in drag with respect to the initial airfoil. The same optimization problem is solved using the three optimization algorithms. The sequential quadratic programming algorithm is found to outperform the other two algorithms, even though they all converge to a similar solution. 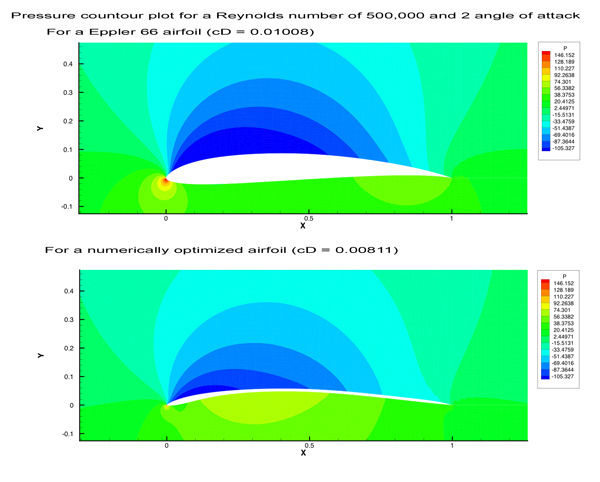 Finally, the developed design tool is used for the preliminary design of a set of airfoils for an airfoil aircraft. This project was finalized in 2004. However, the group is still interested in pursuing applications of shape optimization to energy systems.